7. Take over America and make it, "Safe," in his opinion, although Eclipso starts driving him mad. Yes, this is a big book that includes a number of tie-in issues and even with all of that things seem to move at a pretty quick pace. It goes without saying that Lord's plan falls apart and Batman recruits a variety of people to make his new Justice League that currently is coming-out from DC. 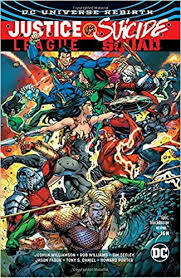 It is a really silly book full of lots of squabbles and action, a plot that just kinda makes sense if you let a lot of thing slide (especially with a big reveal at the end that places a lot of blame on Amanda Waller, because of course she's up to no good). Lots of crowded scenes happen. From that above summary of a variety of things that occur and all the characters you probably can imagine a lot of things are, "In motion," at a time as it were, and the pages do indeed get pretty busy. When you've got the Justice League, the Suicide Squad, an old Suicide Squad, and some other random folk all just duking it out things get hectic. The various writers and author of the main, "Event-comic," Joshua Williamson make it all work pretty well however. The art is a bit less impressive as it can really vary in quality, with the main book having a rotating cast of artists that make it hard to pin-down any kind of particular style for the series as the art keeps a-changing. This book really is just some good dumb fun, with solid writing and passable art. I think it was the first big event to take place post-Rebirth and I liked reading it. "Justice League Vs. Suicide Squad," is nothing amazing but it is kind of like a popcorn blockbuster--silly, action-packed, and relatively forgettable. 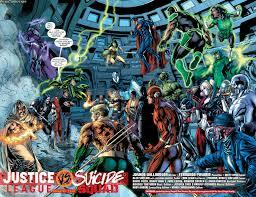 "Justice League Vs. Suicide Squad," can be bought on Amazon, at Things From Another World, via Mycomicshop, or from any other fine retailer.